Melbourne's Luna Park is a historic amusement park located on the foreshore of Port Phillip Bay in St Kilda, Melbourne, Victoria. It opened on 13 December 1912, with a formal opening a week later, and has been operating almost continuously ever since. Luna Park Scarborough at Scarborough, Western Australia, near Perth (1936–1972). Luna Park opened 13 December 1912, after two years of construction. It was built by American showmen J D Williams, and the Phillips brothers who had all had experience in the amusement and cinema industry in the US, and who had worked with Williams in his cinema empire building of the previous few years. Williams returned to the US around 1913, and helped found First National Films which subsequently became Warner Brothers. The Phillips brothers stayed on and ran the park until their deaths in the 1950s. It is not clear exactly who designed the famous mouth entrance; T H Eslick is credited with the design of the park in the opening day brochure, and as the 'engineer-in-chief' in contemporary newspaper reports, while Vernon Churchill was described as the scenic artist "in whose fertile brain the various attractions have been arranged". In the years before World War I, the park was a great success, with attractions such as the Scenic Railway, Palais de Folies (later Giggle Palace), River Caves of the World, Penny Arcade, a Whitney Bros 'while-u-wait' photo booth, the American Bowl Slide, as well as live performances in the Palace of Illusions and on a permanent high-wire. Closed for the war, it did not re-open until an extensive overhaul in 1923 added new and improved attractions, such as the Big Dipper roller coaster, a Water Chute, a Noah's Ark, and a 4-row Carousel made in 1913 by the Philadelphia Toboggan Company. Between the wars, a number of new attractions were made, including Dodgem cars in 1926-7, and in 1934, a Ghost Train. In the 1950s, the park was refurbished, including the addition of The Rotor in 1951. The park remained popular throughout the 1950s, 1960s and into the late 1970s, when some of the earlier attractions began to be replaced by modern mechanical rides. A fire in 1981 destroyed the Giggle Palace, and in the same year the River Caves were declared unsafe, and demolished. In 1989, the Big Dipper was demolished in anticipation of a new large roller coaster which never eventuated. The ride was also demolished due to safety concerns with its age, following a major derailment, that injured 20 people, on the older rollercoaster, the Scenic Railway. The main historic features of the park to remain include the iconic "Mr Moon" face entry and flanking towers (1912, restored 1999), the Scenic Railway (1912), which is the oldest continuously operating roller coaster in the world, and the carousel (1913 restored 2000). Other historic attractions include the Ghost Train (1934), and the fairytale castle-style Dodgem's Building constructed to house the newly patented ride in 1927 (the ride itself was relocated from the first floor of this building to the ground level in the late 1990s). The park also includes many modern attractions such as the Coney Drop, the Spider, a Ferris wheel, and other mechanical thrill-rides. The park remains popular with children and their parents who have fond memories of the park from their youth. A consortium headed by Melbourne transport magnate Lindsay Fox bought Luna Park in early 2005, pledging to restore it to the glory he remembers from his 1940s youth, spent in nearby Windsor. Since the multimillion-dollar purchase, there has been no major overhaul, but the Scenic Railway Station was given a facelift, in 2010 the Coney Island Top Drop (a replica of Coney Tower at Coney Island's Luna Park) was purchased directly from Zamperla, and a major section of the Scenic Railway underwent major repairs between December 2007 and June 2008. The park's triangular beachfront site is on government land, bounded by the O'Donnell Gardens on one side and Cavell Street on the other. Across this street is a larger triangle of foreshore crown land known as the 'Triangle Site', occupied by the grand 1920s Palais Theatre, the 1970s Palace nightclub (burned down in 2007), and car parking. The City of Port Phillip in consultation with the Victorian State Government ran a tender process in 2007 to restore the Palais Theatre and redevelop the remainder of the site. Lindsay Fox was part of a consortium that submitted a proposal which was unsuccessful. Luna Park as a whole is listed by the Victorian Heritage Register, and the main heritage features are listed on the National Trust of Australia. In 2011 and 2012 Luna Park's sign got rebuilt completely out of fibreglass. Work was done on the face while under scaffolding with a material with Mr Moon and the towers printed on it. On 13 December 2012, the amusement park celebrated its centenary. In August 2013, it was announced that a new permanent thrill ride would be installed in the coming months. The ride replaced the G-Force and was revealed to be a permanent installation of the Power Surge, which had previously been a seasonal ride. In 2014 work began on the new House of Carnivalle, the first permanent building to be built on the Luna Park site since the Ghost Train in 1936. This was completed in 2015. The Scenic Railway, is the world's oldest continually-operating rollercoaster. Silly Serpent – powered track children's roller coaster, 540 degree loop of track. 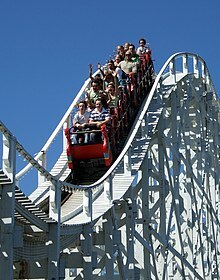 Scenic Railway – opened in December 1912, the Scenic Railway is the oldest continually operating roller coaster in the world, and one of only three roller coasters (the others being in Great Yarmouth, UK, and Copenhagen, Denmark) that require a brakeman to stand in the middle of the train. For these reasons, it is regarded as an ACE Coaster Classic. Originally built from 65,674m of Canadian Oregon pine, the track is 967 metres long. The Scenic Railway's scaffolding is made up of 322 posts. Each train weighs nearly 2 tonnes and reaches speeds of 60 km/h. The Scenic train shed, behind Pharaoh's Curse, is heritage listed. Sky Rider ferris wheel built 1971, moved slightly in 2001 in the parks refurbishment to fit the enterprise. Twin Dragon – a Japanese-built Pirate ship dragon type ride, pendulum swings. The Ghost Train – a ghost train which retains its 1934 tracks. The ghost train was purchased from the Pretzel Amusement Ride Company in 1934. It is one of the only Pretzel dark rides left in the world. Holodeck – a Motion Simulator ride. Amazing Mirror Maze – the mirror maze is made up of 75 individual mirrors. Built 2005. Street Legal Dodgems built 2000 – a Dodgem cars pavilion, based on the original 1927 dodgem cars. The cars are imported from Italy and the old Dodgems track is now the dance floor in the Luna Palace Function room. The Enterprise built 1979, installed 2001 – popular HUSS Enterprise ride. As HUSS no longer manufactures the ride, maintenance costs are increasing. The ride may be replaced soon. Coney Drop built 2010, by Zamperla. The same ride is also installed at Luna Park, Coney Island, only taller and under the name Coney Tower. It is 13 metres tall. Arabian Merry a children's ride designed to look the same style as the entrance towers. Magical Carousel – a heritage carousel built in 1913 by the renowned Philadelphia Toboggan Company in the United States (PTC #30). This is one of the few examples of their work outside the USA and as with the Scenic Railway of heritage value to the culture of theme parks in the United States as well as in Australia. In the centre is a Limonaire Freres large band organ made in 1909. There are 68 horses and chariots and each horse is unique and has a name. Spider built 1983, the 'Spider' model ride was first manufactured in 1967 by Eyerly Aircraft Company. It holds 24 passengers and is a flat ride that can be transported and therefore is not uncommon to be seen at carnivals. In 2001, artist and children's book author, Leigh Hobbs, designed a head to sit on the spider ride, seen today. Pharaoh's Curse – The Pharaoh's curse is a hydraulic powered Japanese style Kamikaze Pendulum style ride at Luna Park Melbourne. It is also known as "Double Arm Ranger", "Skymaster" and "Sky Flyer". There are at least 5 in Australia. It first made its debut in 1984, and was manufactured by FarFabbri & Sartori. The Power Surge – Permanently installed in 2013. Previously a seasonally operated ride. Circus of Screams – Returned for winter 2013 after several years of absence. The Road Runner – built 2017, rotary slide ride. Binky The Train – trackless train. Luna Rink – temporary attraction for winter holidays 2017. Giggle Palace (Palais de Folies) – Built 1912, demolished 1981, destroyed by fire lit by arsonists. Shock Drop (2001–2010) – Was replaced by the more advanced Coney Island Drop. ^ "OH BOY! LUNA PARK IN 1912". The Argus (33, 506). Melbourne. 23 January 1954. p. 7. Retrieved 13 February 2017 – via National Library of Australia. ^ "LUNA-PARK". The Argus. Melbourne. 14 December 1912. p. 19. Retrieved 28 September 2015 – via National Library of Australia. ^ NFSA. "The Opening of Luna Park Melbourne". YouTube. ^ a b "Luna Park, St Kilda". Malvern Standard. 9 (507). Victoria, Australia. 21 December 1912. p. 3. Retrieved 18 May 2016 – via National Library of Australia. ^ "St Kilda by the Sea: Luna Park". Prahran Telegraph. 21 September 1912. Retrieved 4 November 2017. ^ "Luna Park - Face & Scenic Railway in the National Trust Database"
^ Centenary celebrations for Melbourne's Luna Park. ABC News. 13 December 2012. Wikimedia Commons has media related to Luna Park, Melbourne. This page was last edited on 27 March 2019, at 10:32 (UTC).